Urban Horse promotes a Back on Track Therapy Horse Shoulder Guard / Anti Rub Vest with Welltex Infrared Technology. Available in Black. This new unique Back on Track horse shoulder guard is a fantastic product to aid the blood circulation around the shoulder area due to the unique function of the Welltex fabric. The shoulder guard has a snug fit design covering the pectorali's muscle in the chest, trapezius around the withers as well as the deltoid muscle. The Back on Track shoulder guard can also be used for the prevention of muscle tears and fatigue. The Back on Track Shoulder Guard also minimises the rubbing effect of horse rugs. The three pads on the sides aid the relief of pressure from the withers and the shoulder. These are made of high functional three dimension padding for better airflow. The Back on Track Shoulder Guard can be used all year round but it also perfect for the colder winter months. The Back on Track Shoulder Guard is ideal for horses that have to perform where the muscles are under greater strain to prevent injuries. 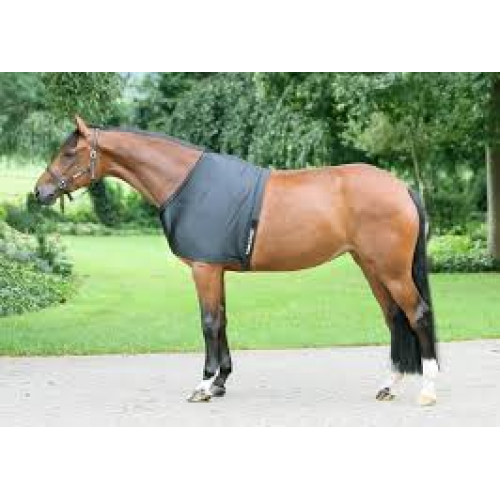 It is also suitable for horses recovering from shoulder injury or simply for general well being. Available in the following sizes - Please choose the same size to match your horses normal rug size. The Back on Track shoulder guards do come up small so if your horse is between rug sizes - choose the larger size!! The Welltex - Material means that your Horse or Pony can benefit from the restorative properties of infrared heat. Ceramic powder is melted into the fibres of the fabric. The Welltex - Material reflects body heat in the form of infra red heat, an energy form know to increase well-being. Reflected body heat can reduce muscle tension and increase blood circulation which helps speed up recovery from injury as well as reducing the possibility of injury making it really popular among eventing / endurance riders.